Today we visited a slick, contemporary garden in Essex designed by Sean at Cube 1994. Sean’s clients here wanted their courtyard garden to be transformed into a modern multi-purpose space. The courtyard was designed into a series of spaces each to be used differently – a relaxing area with sofas and a 1.6m long fire table as its centre piece, a sheltered dining space with outdoor kitchen and an open-air dining space. This provided the perfect inspiration for Pat’s garden and how Alan should go about extending the glamorous style in Pat’s house to outside. 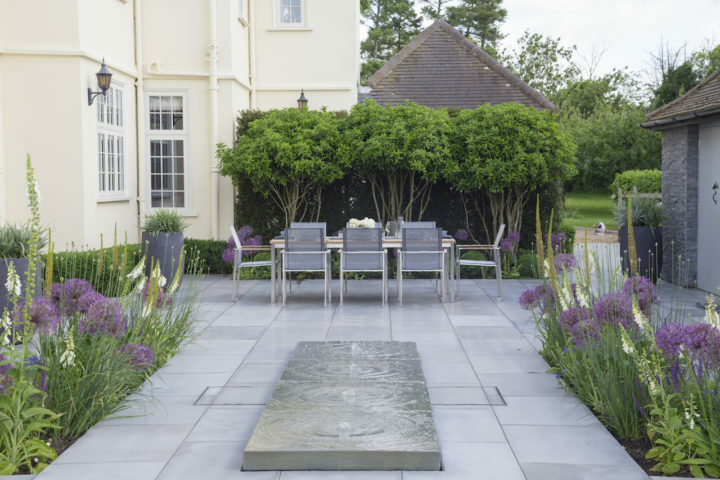 High-spec landscaping dominates the space, with sleek pavers, classy water features, modern stone cladding and minimalistic neutral-coloured planting, all of which we transferred over into Pat’s garden.